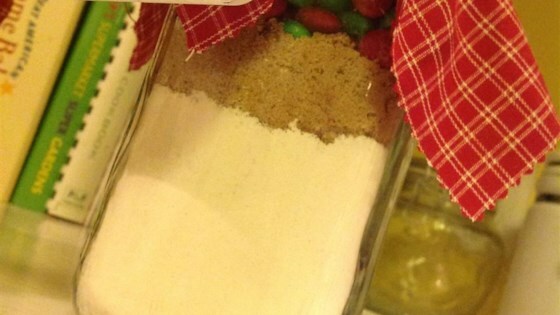 "M and M's Cookie mix in a jar with tag attached with directions on how to prepare the mix. These make wonderful gifts to give any time of year and also for wedding favors, hostess gifts, baby showers or take to a cookie exchange and make sure to bake some up so people know what they taste like to. Store in a cool dry place away from a heat source so condensation and clumping does not occur. Enjoy!" Instructions to attach to jar: M & M's Cookies 1. Empty jar of cookie mix into large mixing bowl. Use your hands to thoroughly blend mix. 2. Add 1/2 cup margarine or butter softened at room temperature. DO NOT USE DIET MARGARINE Mix in 1 egg, slightly beaten, and 1 teaspoon vanilla. 3. Mix until completely blended. You will need to finish mixing with your hands. 4. Shape into balls the size of walnuts and place on a parchment lined cookie sheet 2 inches apart. DO NOT USE WAXED PAPER. 5. Bake at 375 degrees F (190 degrees C) for 12 to 14 minutes until edges are slightly browned. Cool on cookie sheet for about 5 minutes then remove to wire racks to finish cooling. Makes 2 1/2 dozen cookies. The recipe is super simple which I love and it looks great in the jar. I made all the Cookie Mix in a Jar recipes and this is the only one my family wasn't crazy over. These cookies were too dry & crunchy, with not much flavor. I think they need more butter or something; dough was very stiff & dry.